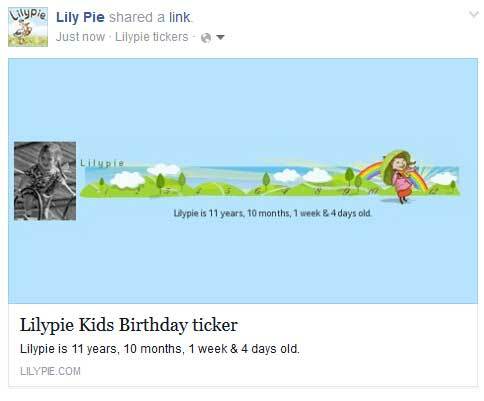 Lilypie - Pregnancy, baby and parenting tickers. More tickers on our sister sites: LilySlim, Daisypath and PitaPata. Create your own free daily updating ticker. The Lilypie site has been redesigned to make it easier to use on all platforms, and easier to share your tickers. When you create or edit a ticker, you can share it by clicking on the facebook, google plus, pinterest, tumbler or twitter icons below the preview image. In the My Lilypie section, you can display the ticker options either by hovering over the ticker (on a desktop computer) or tapping on the ticker (on a mobile or touch enabled device). You can share the tickers directly from the My Lilypie section page, or by clicking on Get ticker code. When you Share your ticker to facebook or Google+, the image is formatted to that site's preferred width and height, and the ticker text added to the description. Of course, you can still add your tickers to your website, forum or email signature using the code snippets on the ticker code page. On mobile devices there are two new menu icons in the header. Site menu. Tapping on this displays a menu for Home, Help, News, Due date calculator and My Lilypie . Account menu. 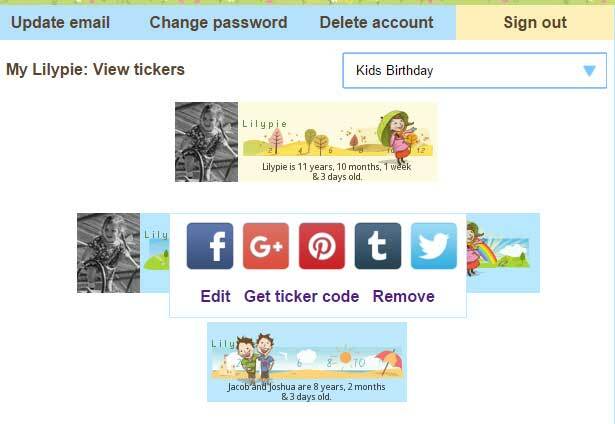 When you are in the My Lilypie section, this gives you access to account options such as My tickers, Update email, etc. Every page on Lilypie has been rewritten and retested, and all the help pages updated but it is always possible that I have missed something, so if anything doesn't seem to be working properly or doesn't make sense, please do let me know. All the great feedback over the years has helped to keep Lilypie running for over a decade and I really appreciate it. I have updated the Share buttons in the Lilypie iOS App to use Share Sheets. 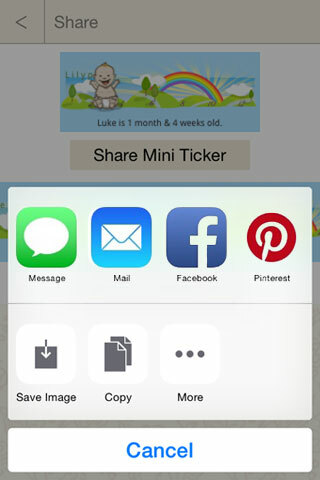 Share sheets allow ticker images to be posted to Facebook, Twitter, Mail, Message and your Camera roll. In iOS8 other Apps that have enabled sharing (such as Pinterest) can also be added to the Share sheet. The Lilypie Android App is available on the Google Play store. © Amanda Crichton 2004 - 2018. All rights reserved.